Apple today told several news sites that it plans to discontinue its Thunderbolt Display, which has been available for purchase online and in Apple retail stores since it was first introduced in the summer of 2011. "We're discontinuing the Apple Thunderbolt Display. It will be available through Apple.com, Apple's retail stores and Apple Authorized Resellers while supplies last. There are a number of great third-party options available for Mac users," said an Apple spokesperson. Apple will continue to sell existing Thunderbolt Display stock so long as it remains available, but once stock is exhausted, the Thunderbolt Display will no longer be available as production is ceasing. It is not clear why Apple has decided to make an announcement concerning the discontinuation of the display and if it means a new 4K or 5K display is on the horizon. Stock shortages ahead of WWDC sparked rumors that Apple might be planning to introduce a new display at the event, but no new hardware appeared and Apple instead focused on software for iOS devices, Macs, Apple TVs, and Apple Watch devices. Rumors have suggested Apple is working on a 5K display, and if true, such a display could feature a resolution of 5120 x 2880 pixels, USB-C/Thunderbolt 3 peripherals, and a design that mimics the latest iMacs. Speculation suggests it could come equipped with a built-in GPU or use a DisplayPort 1.2 Multi-Stream Transport setup to stitch two halves of a display together to make one seamless display. 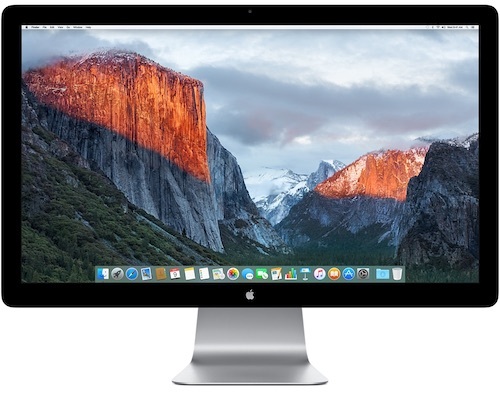 If a new Thunderbolt Display is in the works, it could launch alongside next-generation Skylake Retina MacBook Pros, which are rumored to be in the works for late fall. they couldn't figure out how to make it thinner. Why so? It has been one of the best quality displays available in the market IMO. Not by a long shot. 2560x1440 110ppi display for $1000 in 2016? USB 2 ports? My $500 Dell P2715Q blows it out of the water, is matte, 4K, IPS, 3X USB 3.0 ports, identified by macs as a Retina display with multiple scaling options and is an absolute dream to look at/edit video on. I'm sure anyone with $1000 could do even better than me, but I opted for two of these Dells to go with a custom built 12 core Haswell-E/980Ti hackintosh because I simply couldn't push myself to buy a 2013 Mac Pro with worse video and CPU for more money. I'll pay the apple tax all day, but for frick's sake at least keep the hardware current so I don't feel totally jipped. Their official statement really leads me to believe they're just going to straight up not make a standalone display anymore, though. Okay. So this is the direction Apple is taking. Unless Apple exceeds my expectations with the MacBook Pro refresh, I'm done with this company. There's nothing for me here anymore. Apple is now dead to me. Rose Gold that will look pretty with large heart emojis. There are a number of great third-party options available for Mac users,” said an Apple spokesperson." Pretty interesting for the spokesperson to say this. Can be interpreted in many ways, but I see it as, "Yeah, we can't make any money off of these anymore with the growing market for computer monitors. Get whatever you want." You obviously have never used one. Why would you, when there are better quality monitors at a far lower price? Apple is really mailing it in these days, Mac hardware-wise. They've just stopped giving a damn.